Did we really think that we would leave Afghanistan without experiencing some semblance of warfare? Well, our last night in Kandahar featured the first weapon exchange during our stay in Afghanistan. It occurred in the middle of the night (approximately 2:00am-ish) and there was no mistaking it. Judging by the sound (like I have a trained ear for this stuff? ), it seemed like rapid gun fire and several rocket launches. It lasted for maybe 30 minutes and you could hear the rockets landing, but it was definitely in the distance. The sound was actually mesmerizing; much like the way we all run to the window and watch in awe a good lightning storm. So I lay in my bunk wondering what exactly to do. Part of me wanted to go outside and see for myself what was going on (albeit a SMALL part). The rest of me said to stay put and not get in the way. Our UDC training taught us that if were in imminent danger, we would have been instructed to head for the nearest bunker via some kind of intercom system. Judging by the sound, I assumed (I know, I know) that it was mainly artillery fire going out, which was confirmed in the morning. Fortunately, there were no strikes reported on the base. The USACE assignment in Afghanistan is wrapping up on Tuesday. Our travel calls for us to a return to the US through Dubai. 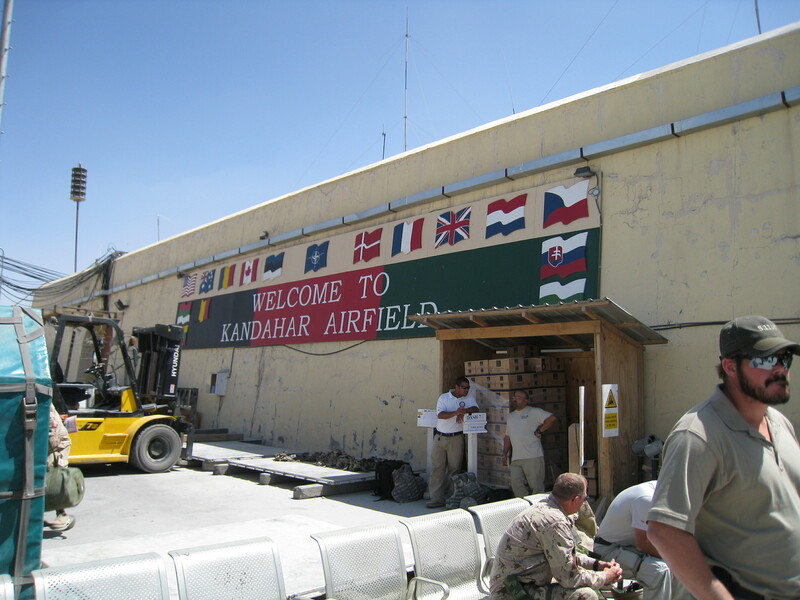 We will be departing from the TLS hanger at Kandahar Airfield (don’t you just love the inviting welcome sign?). By the way, any guess as to what TLS stands for? Todays history lesson is this hanger is where the Taliban made their Last Stand, back in 2002 I believe. As I heard, there were around 400 Taliban killed in the hangar during the final conflict. The hangar itself is still being renovated today. As I walk around it, I would swear that some of the holes in the wall are bullet holes. Unfortunately, there were no pictures allowed inside the hangar (or near the flight line). Technology at the hangar is not very sophisticated. When we arrived, we lined up outside, single file. We were given a “boarding pass”, which was essentially a business card size piece of plastic that said…get this…”boarding pass”. No flight information, seat number or airline name. After our bags were scanned, we had to pass customs, which consisted of one women sitting at a cafeteria style table and confirming that the name on our passport matched the name on her Excel spreadsheet printout. Immediately to her left was another folding table with a handmade sign that read “Chaplains Corner”. Very comforting. Flight announcements were periodically made by a man walking around yelling “Anyone on the flight to Bagram (or Kuwait, etc.) please line up now.” After our flight was called, we all lined up and walked out onto the tarmac and toward the plane. As we boarded, we merely had to hand in our “boarding pass”. There was no further identification required. As we made our way passed the flight attendant, I was instructed to “please take any empty seat”. As I passed through a half-filled first class section, I really wanted to grab one of those seats. But I thought this might be the last place to make any waves, so I just took the first coach seat available. I’ll write my final wrap up post when I return to the USACE office in Virginia. Thanks again for the blogs. It’s good to hear that you are coming home soon. Take care!